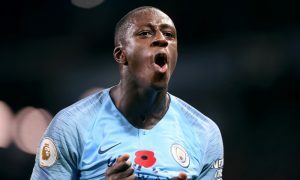 Benjamin Mendy is making a surprise return to action tonight as Manchester City’s Elite Development Squad face Manchester United in the Premier League 2 at City’s Academy Stadium. The 23-year-old hasn’t kicked a football since September when he ruptured his ACL, and will step up his recovery tonight in the Premier League 2 derby. The chief 麗 @benmendy23 returns for our #PL2 derby against @ManUtd! With vital minutes soon to be under his belt, the Shark Team founder is likely to start working his way back into Pep Guardiola’s first team soon and could make some substitute appearances in the coming weeks.